What’s up music lovers! It’s Andy Gesner and the staff from HIP Video Promo, here to share a new clip from a pioneering rap crew who the world is just beginning to catch up to. The story of hip-hop has mostly been told in the big cities: the styles cultivated in New York, Los Angeles, Houston, Miami, and (lately) Chicago have come to define the genre’s conventions. But what about those who prefer their hip-hop unconventional? Smaller cities have their rap histories, too – tales more byzantine and, quite often, more fascinating than those told in the metropolis. Nonconformists thrive in these smaller cities; there’s room for a group of uncompromising artists to champion their own methods and create their own trends. Social Deviantz have, since early 1992, been following their instincts and chasing visions down dark corridors, and in so doing, they’ve become both Vancouver’s longest-running rap collective and one of “Vancity’s” most notable contributions to urban music. Essential Mental Nutrients, the group’s 1996 debut full-length, established the style: thoughtful and challenging arrangements, jazz-soul accompaniment, horns and piano, highly allusive and poetic lyricism, and relaxed, mesmerizing flow. Emcees A-Train and Fatbone eschew aggressive posturing, instead delivering their provocative rhymes with the intellectual assurance of spoken-word veterans. Several of the tracks on Essential Mental Nutrients were unusually brief: a few minutes of dense, punchy rhymes, a quick ride on an irresistible groove, and an unapologetically sudden ending. It’s an economy of delivery unusual in hip-hop, and a style they’ve perfected on subsequent EPs and compilations, each one more experimental and free-wheeling than the last. 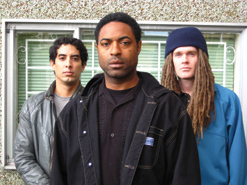 Bleaky Deky, their 2006 studio album, is recognized globally for what it is: a twenty-four track tour de force, and the most exciting entry in the Social Deviantz discography. It’s also the most characteristic record they’ve ever made, crammed with tight, short hip-hop shards and haunting, elliptical, deliberately abbreviated statements. Standout cut “Red Tape” clocks in at 1:23 – but Fatbone manages to say more in that minute and a half than many rappers do on entire albums. “Red Tape” appears on the upcoming Spread collection, a bracing 8-song overview of a rap career that has spanned two decades and helped to define the pop sound of a major (but often overlooked) North American city. Social Deviantz look the part of rap mavericks, too. They tend to ignore rap music’s fascinations with money and fashion; they wear their hard experience on their faces; they approach the microphone with respect, and address it with the assurance of those confident in their skills. In keeping with underground rap tradition, the act has occasionally obscured their faces; in the “Red Tape” video, the masks are discarded, and the emcees give it straight to the camera. Directed by Junya – the crew’s deejay and longtime producer – the “Red Tape” clip is a dazzling compendium of split-screen images of Social Deviantz in action. Junya handles film the way he’d cut a record on the turntable, sliding artfully from one shot to another, juxtaposing footage of A-Train with that of Fatbone, blending the shots into a seamless whole. And just like the track itself, it all comes to a sudden, arresting halt at the minute and a half mark – so don’t sleep. We are stoked to be working with Junya and the rest of our friends north of the border at Dease Records. We have also been lucky enough to secure a hoard of Spread, the must-hear new CD from Social Deviantz. If you need more info, call Andy Gesner at 732-613-1779 or e-mail us at HIPVideo@aol.com. You can also visit www.DeaseRecords.com or www.Myspace.com/SocialDeviantz to find out more about Social Deviantz.